In this episode, we discuss Google’s move to insert ad blocking features into the Chrome web experience, and what it might mean for the future of marketing and advertising. We also dig into some new research on the high demand for marketing skills, and explore executives’ love of long-form content. Our rants and raves cover content workflows and mission statements; then we wrap up with a content marketing gem from the early 20th century. PowerPost – Welcome to the Age of Power Publishing: As content marketers, we understand the importance of creating content that not only educates, but inspires consumers to take action. As a result, we have entered a new era of “brands as publishers” – where brands are increasingly becoming publishers in their own right. With brand publishing and content distribution come several key steps to the publishing process. But the elongated process of content creation, review, scheduling, and tracking analytics can often take more time than we have. Built by marketers for marketers, PowerPost is a time-saving tool for companies who manage content for multiple brands with multiple users – whether it’s a regulated industry or creative agency. With PowerPost, your team can publish from one location across all of your online platforms, quickly and efficiently turning your brand into a power publisher. To help more brands excel at publishing, join us for a webinar on May 9th with CMI founder Joe Pulizzi. We have also created a comprehensive e-book, with insights from 50 experts in the content marketing field, and their strategies on conquering the five pillars of brand publishing: content planning, workflow, distribution, analytics, conversion. Claim your download at powerpost.digital. Google may introduce an ad-blocking feature for its popular Chrome browser (11:31): Looking to enhance the quality of its mobile and desktop experience, the big G is working on a tool that would filter out some of the online ad units that users often find to be most irritating – such as pop-ups, auto-play videos with sound, and prestitial ads with countdowns. According to The Wall Street Journal, if Google decides to launch the feature, it would base blocking decisions on the quality standards established by the Coalition for Better Ads. Considering Chrome’s leadership position among browsers – as well as Google’s overall dominance in digital marketing – Robert wonders whether this launch will turn out to be the tipping point for the changes that need to be made across the digital ad ecosystem. Yet, I bristle at the idea of Google becoming the sole “judge, jury, and executioner” when it comes to ad serving. The most in-demand marketing skills in 2017 (24:25): MarketingProfs reports on a new McKinley Marketing Partners study that characterizes the current talent and hiring landscape for digital marketing. The report found that there’s a high demand for digital advertising, content creation and curation, and content strategy skills in marketing, while graphic, web, and visual design skills topped the list of the creative services businesses need most. The findings confirm my belief that marketing skills of all kinds are going to be in high demand for a long time, while Robert sees a tremendous opportunity here for potential employees to differentiate themselves as providers in this market. The media habits of the world’s “smartest, busiest people” (34:20): Quartz released its new Global Executives Study, which surveyed 1,357 executives from around the world to find out how they get their news, why they share content, and how they feel about advertising. Among the notable findings of the study, which has an infographics-like interface that made Robert smile, are that 84% of executives cite long-form articles as the content format they are most likely to share, and 74% found the last piece of sponsor content they read to be interesting, informative, and valuable. Robert’s rave: We don’t often toot our own horn in PNR, but Robert can’t resist sharing his enthusiasm for a recent CMI post, 30 Habits of Highly Productive Content Teams. Based on a session delivered by Heinz Marketing’s Matt Heinz and Workfront’s Heather Hurst at our annual ContentTECH virtual event, the stellar, in-depth article written by Marcia Riefer Johnston is a must-read for anyone looking to learn how to efficiently scale their content marketing team and its output. It’s a master class in blog post form. Joe’s rave: Though I was offline for most of the past week, this article on corporate mission statements made it through my filters. I have a particular affinity for content marketing mission statements, so there are a few points made in this article that really struck a chord for me, including the need to make them personal and distinct. When (not if) you create your own editorial mission statement, make sure it speaks in your unique brand voice and clearly communicates the distinct value your content provides for your industry niche. In his limited downtime, Robert has been known to geek out on our industry by reading old marketing trade magazines from the early 20th century. Recently, he came across a few gems in the July 1916 issue of a magazine called Advertising and Selling. The first is an article from the Association of National Advertisers (ANA) that argues against the issue of “forced circulation” – essentially, publishers that buy traffic in order to increase their circulation numbers, thus justifying increasing their ad rates. Robert found this to be an interesting parallel to our current struggles with ad fraud and publishers buying traffic. 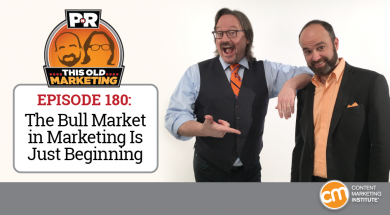 The magazine issue also led to a fascinating realization: We had long assumed that Content Marketing World was the first-ever conference focused on content marketing but, as Robert learned, this isn’t actually the case. You may recall us mentioning the concept of a “house organ” on previous PNR episodes, explaining that it was an early term for external-facing magazines published by a brand. 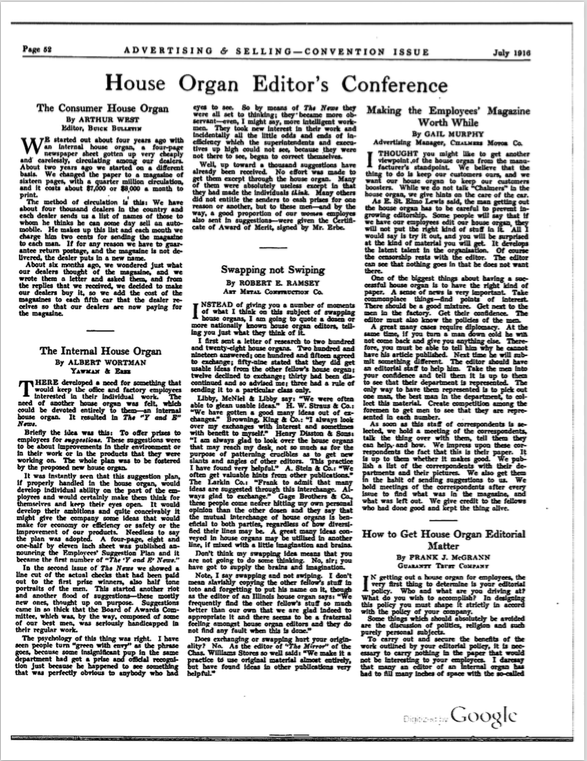 It turns out that this issue of Advertising and Selling features session coverage from a trade event that took place in 1916, called the House Organ Editor’s Conference. Essentially, this coverage amounts to six marketing case studies, including one from the editor for Buick’s brand magazine, which describes how the company revised its circulation method to enable its dealership partners to directly benefit from the magazine – and pay for its printing and distribution costs in exchange for the privilege. Many of the issues discussed at the conference are challenges that our industry still struggles with, earning it a retroactive This Old Marketing seal of approval.